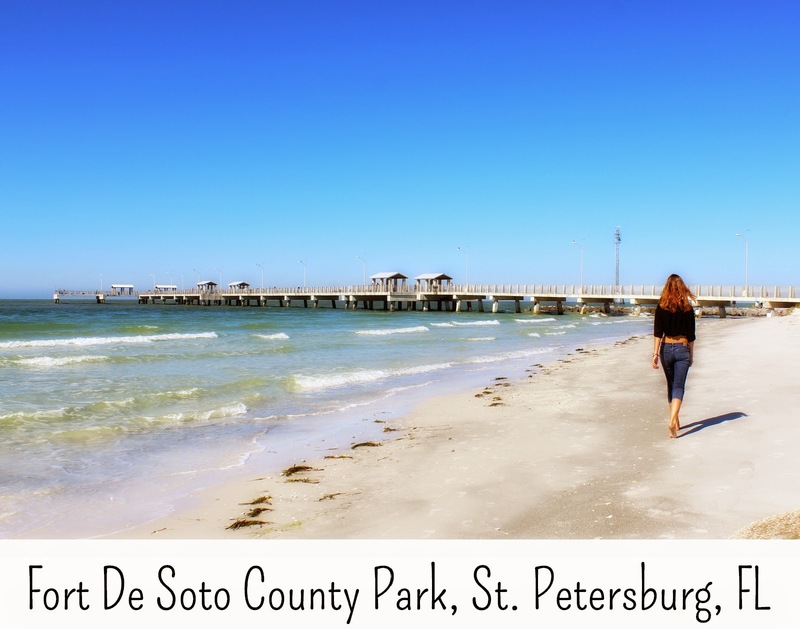 The kids had a Monday and Tuesday off of school so we, once again, visited our most favorite campground in Florida, Fort De Soto County Park. Fort De Soto has the most beautiful beaches. Nice and shallow a ways out, with wonderful soft white sand. Yes, the sun is setting and he's still in his pajama pants from the night before. One of the many benefits of camping. If you look closely in the water of the above image about 3/8" over and down from the picnic area point, you'll see a dolphin's fin. We were wandering along the seawall when we heard a huge splash, right next to us. So close to the seawall that I thought one of the kids had fallen in. After a quick head count we looked closely just as he came out of the water again, so incredibly close to us. It really felt like he was just looking for someone to play with. We watched him until he decided to head back out into the bay. An absolutely beautiful and awesome bit of time for all of us. The view from our campsite, it never ceases to amaze me. And that tree never ceases to amaze the kids, I've got pictures of them climbing it last summer too. The campsites themselves are quite large, with this expansive grassy area just outside the site that really feels like an expansion of the site itself. So, the exciting bit. My very own homemade awning. I've been meaning to mention this for months but never had the camper set up to take pictures of it. We've done without an awning since we purchased the camper, so it wasn't an absolute necessity, but I found a way to do it inexpensively and couldn't resist. To begin make 12 tarp attachers from the paracord, washers, and spaces. I cut the paracord, burned the end, strung the washer and spacer through it, strung the paracord back through the washer, then tied a simple knot. When finished they should look like this pinterest pin. The pin originally linked to an Ebay listing of a fellow pop up camper owner who sells the attachers. I don't currently see any of his items listed, but if you don't want to do the work yourself it may be worth checking the link on occasion to see if he relists. Push the spacer, with the attached paracord, through the holes of the tarp, adding an attacher at each hole along one side. You should have two attachers left over. When attached to the tarp the spacer should be one one side of the tarp grommet, the washer and knot on the other. I leave them attached for travel and they've not come out. Before the camper is raised thread the spacers through the campers pre-existing C channel, left from the original canopy, and run the spacers down the channel until you've got one at each end. Seriously, do this before the camper is raised unless you're very, very tall ... it's much easier to do the threading and running at eye level. Add attachers to the tarp holes at the two exposed corners. These attachers will connect to the extending poles. If you happen to not be able to find one of your attachers the tarp can easily be attached to the poles with some of the line. No big deal. Now raise the telescoping poles. We left ours lower than the height of the original canopy C channel so any water would drain off if it rained. Stake your line and tighten. Voila. Your camper now has a canopy. Yes, it's a little less classy than a pretty, fancy one but it works just as well. And I think it's well suited for a 20 year old pop up camper. Grab a chair and sit down in your newly created shade and have a beer. Or a margarita. Or a tall glass of sweet tea. And admire your undeniable mad DIY skills while congratulating yourself on a job well done. One truth about having many children is that you will never, ever get them all to look photo ready at the same time. This was one of fourteen attempts. It won't end up on a Christmas card* (especially without the oldest in the picture), but the happy smiles and laughing make it pretty fantastic, I think. *Eating my words ... it did end up being our Christmas card with a snapshot of the oldest added in!